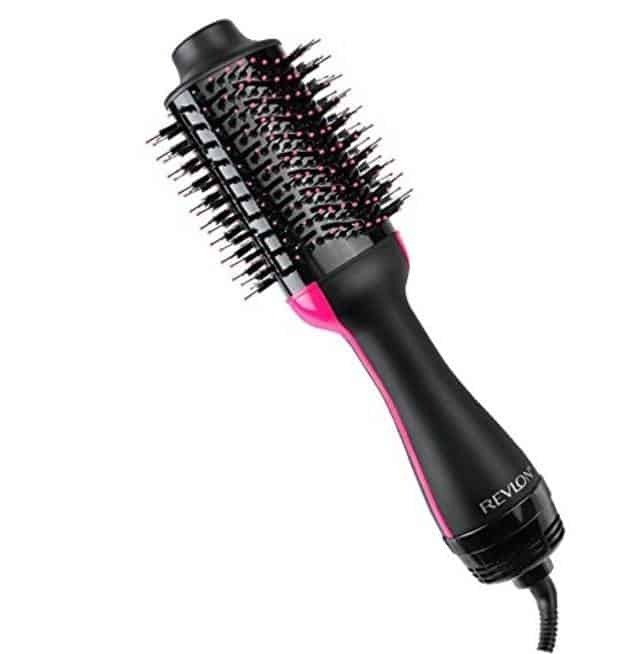 In this feature review, we look at the Revlon One-Step Hair Dryer Brush, which is meant to volumize while taking your hair from wet to beautiful finished style that will look like you’ve been to visit a salon that day. It can be used on dry hair to give a smooth, shiny blow-out look to even fine hair that has trouble gaining lift and volume. The handle of the brush is an ergonomical design that will keep your hand from becoming cramped. It also reduces time spent drying, curling and styling your hair, so it’ll keep your shoulders and upper back from hurting after prolonged use. It reduces the need for a variety of products, too. Instead of using a blow dryer, brush, curling iron or straightener, you’ll toss all those products aside for this all-in-one dryer brush. This styling hot air brush differs from others we’ve reviewed since many people are able to use it as a complete hair drying system. While other brushes require you to dry the hair to approximately 80% dry, this brush is more like a hair dryer, which truly keeps you from having to purchase a separate hair dryer. You don’t need to worry about holding a large brush while using the blow dryer, either. This drying brush can be used one handed. After washing your hair, use the styling product that you love. A hair oil can keep the heat from causing problems with your hair. While you have the option of choosing the right heat setting for your type of hair, it’s always best to minimize the impact of heat to your hair. Comb your hair and divide it into sections so you can start with the hair underneath first. You might want to start with the highest setting as you brush through the hair so it’s not as wet. Once it’s somewhat dry, you can lower the heat. Some users recommend that it’s used from high heat to dry the hair to low heat for styling then cool for setting your style. 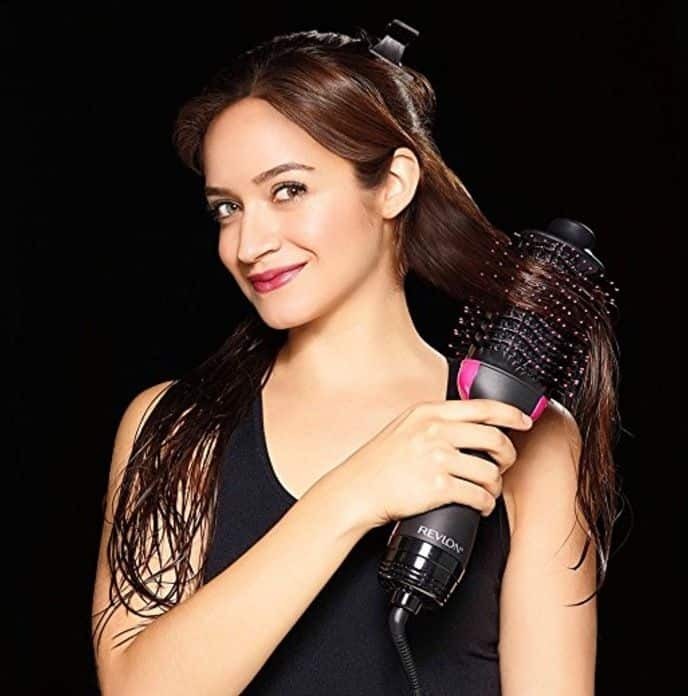 Watch this quick video tutorial to see how the Revlon Oval One-Step Volumizing Hair Dryer Brush works! The volumizing brush is oval shaped for a reason. The edges of the brush are thinner than the front and back because it allows you to get in close to the scalp and curve the brush to create volume. When you can lift and curl close to the scalp, you’ll create a voluminous look that does make it seem that you had a blow-out done in a salon. The 2-inch brush can be used on short or long hair. With long hair, it’s important to ensure that you’re not twisting and tangling hair in the bristles, though. This dryer uses ion technology to create dryer and shinier hair in less time than it would take for a blow dryer and brush on your own. There are three heat settings, which give you a customized experience. You can choose the setting that works best with your hair. Thin or treated hair might need less heat while coarse, curly hair will need a high heat setting. You’ll want to use the right heat for the amount of drying and styling needed, too. The brush has a combination of two types of bristles. There are long, nylon bristles for detangling while brushing the hair and drying it initially. The tufted bristles closer to the base of the brush are used to separate the hair for styling purposes. It’s important to brush the hair gently. The combination of bristles can pull hair from the scalp if you’re not careful. How many watts does this product have? 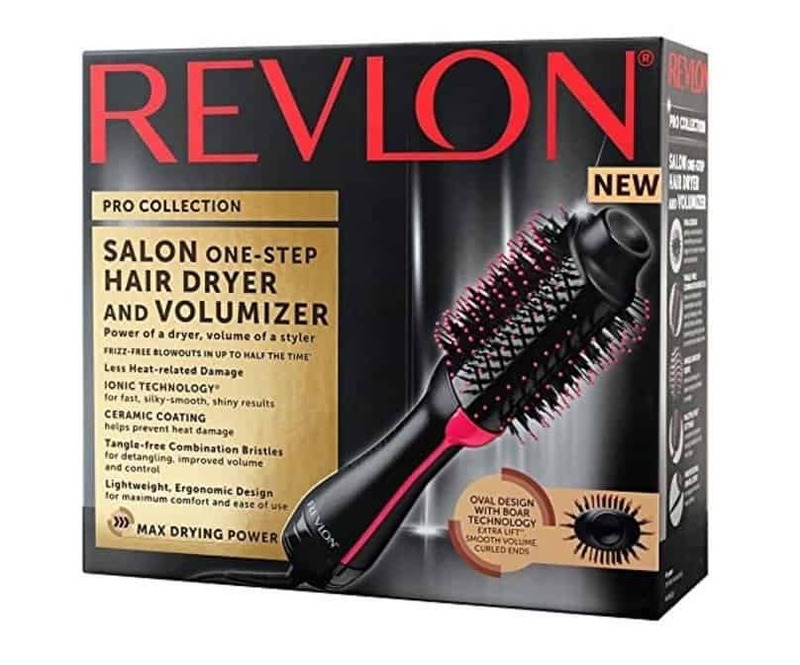 Does the Revlon dryer brush spin, and can the brush part be removed? The brush doesn’t spin, but the oval shape gives a great variety of shine surfaces. There’s no way to remove the brush. Will this device help with static and flyaway hair? This is the perfect dryer for hair that is prone to static and flyaways. For some women, the time of year makes a difference, too. Make sure your hair is hydrated properly, and use this product with its ion technology to tame unruly hair. Does it work on super thick hair? When the hair is sectioned, you don’t have to worry about how much hair you have or the thickness of it. This makes it a great device for thin or thick hair no matter the texture, too. The Revlon One-Step Hair Dryer is a good device as long as you understand what it can accomplish. It’s meant to be a fast hair dryer while providing smooth volumizing hair styled as if you’d gone to the salon for a blow out. You won’t get much in the way of waves or massive curls with this. It can be done, but it’s not the perfect product for that. Use it for its intended purpose, and you’ll love it!